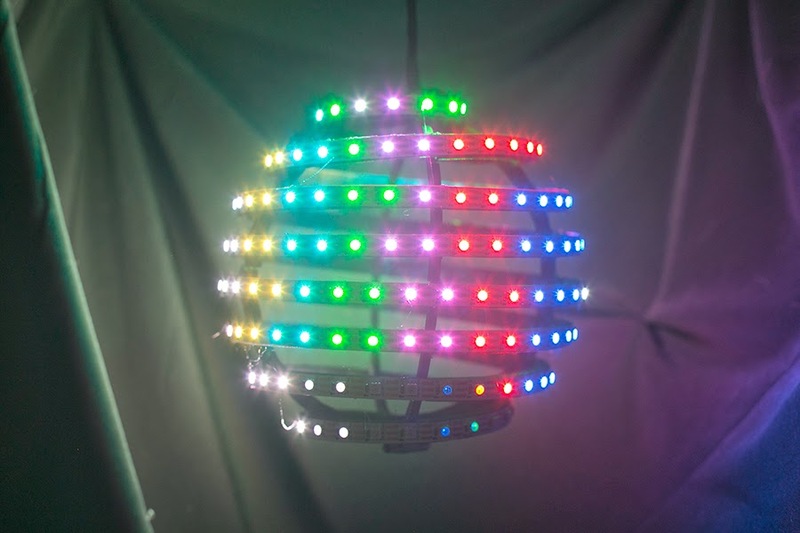 In my last post, I discussed the process of building a spiral-sphere of LEDs that could be controlled from my laptop. The purpose was to create visuals for each movement of Gustav Holst's The Planets for an upcoming concert of the Boulder Symphony Orchestra. I wrote about the math that went into the design, the process of 3D printing the structure in many pieces, and powering the LED strip that was glued to the outside. Each task on its own was a formidable challenge. Implementing all of these together would require code written on multiple platforms, from a tiny 8-bit microcontroller running at 16 MHz to my workstation-laptop with a 64-bit quad-core processor running at 2.4 GHz. Luckily, every platform I had to work with could be programmed with C, so I could stick to one language throughout the whole project. 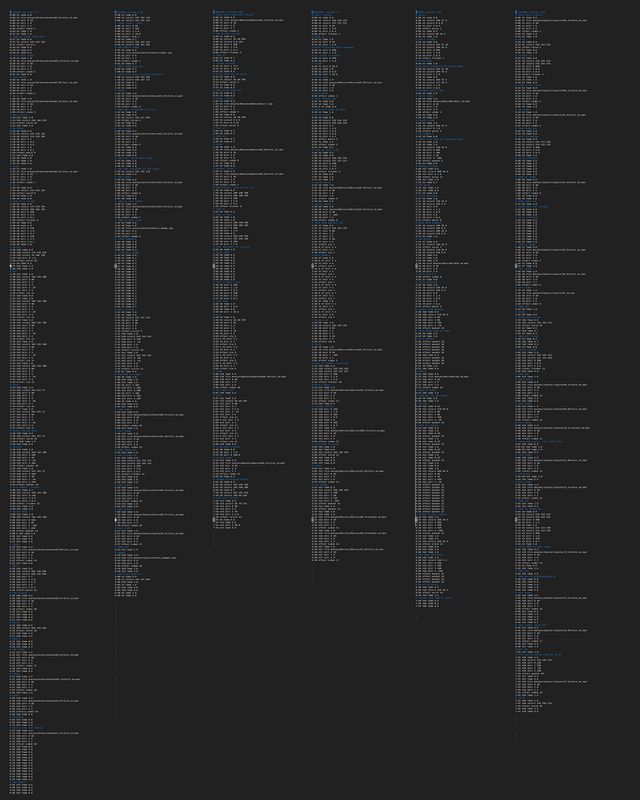 While the entire code for this post (as well as my last 3 posts) is hosted on github, it's an ugly beast of a code. I'll try to include relevant code examples that have been isolated from the main code and cleaned up for legibility. The idea here is to visualize how long different blocks of code take by displaying them as, well, blocks. The horizontal bar that contains the red, yellow, orange, and white blocks represents what a given processor is doing. As time passes from left to right, the processor performs different tasks, each colored differently. The lower bar that remains the same color represents the LED strip. It does not do any appreciable data processing, so I'll treat it as a passive item. The vertical arrows from the processor to the strip indicate the flow of data, and are positioned in the center of a code block that handles the transfer. Finally, the vertical lines in the background give the time-scale of things. I have placed these 33 ms apart, since that is our target update time. Their spacing on the screen may change between images as I zoom in and out of different features, but they will always represent the same time step. The goal is to transfer new data to the LED strip at least every 33 ms in order to get an update rate of 30 Hz, so in this kind of diagram we want to see one of those black arrows occur at least as often as the background lines. In the example above, the processor serving data to the LED strip is not fast enough. I've measured the time needed to run various blocks of code by hooking up a Salea Logic probe to a pin of the relevant computing platform and triggering responses by inserting commands to toggle the pin to a 1 or 0 in the code. In most instances, the toggling takes around 0.0001 milliseconds. Since I'll probably be rounding most timing figures to the nearest millisecond, I've treated the toggling as instantaneous. As with many of my projects, I used a flexible strip of WS2812s as my LEDs. These are surface-mount RGB LEDs with on-board memory and driving. Data for what color the LED should be is shifted down the strip to each LED through a single line. The datasheet for these LEDs gives details about how data must be formatted in order to properly communicate with them. The key to reliable data transfer to the strip is precise timing. Luckily, there are a few freely-available libraries on the internet that handle this timing. I happen to prefer the Adafruit Neopixel library, but I have heard that there are others just as good. 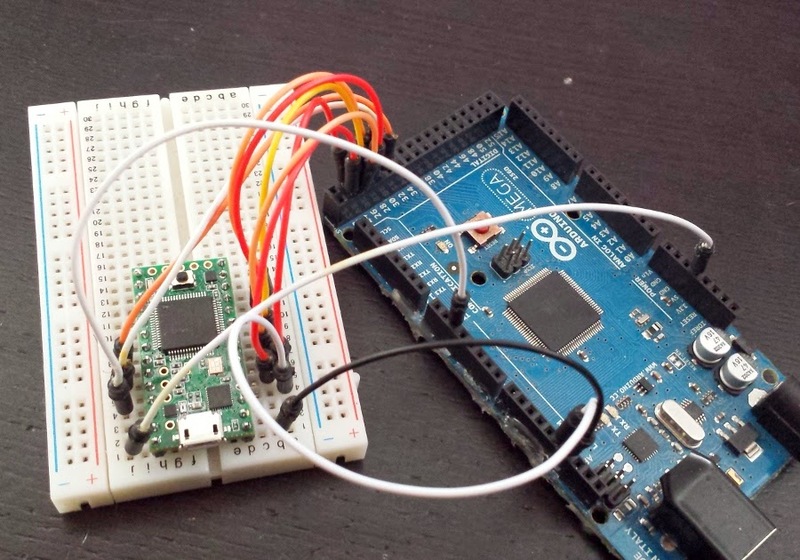 This library includes sections of Assembly code that are hand-tuned for various architectures and processor speeds, all intended for use on an Arduino-compatible microcontroller. Since I'm just barely comfortable reading Assembly, I'm glad someone else has taken the time to work out this library for others. If all we want to do is keep telling the strip to update, we can get a frame rate of over 130 Hz. Unfortunately, this doesn't allow for changing any of the LED colors ever. Hardly seems worth the frame rate if the image never changes. What we want is for a separate computer to do the complicated calculations that determine what image should be displayed, then the computer sends the LED values to the Arduino Mega via USB. The data is parsed on the Mega and then the LED strip is updated. I've added a new bar to show what my laptop was doing. The blue blocks are the USB transfer and the white blocks are delays introduced to keep things synchronized. On the Mega, the orange block still shows updating the LED strip, the yellow block is parsing the data buffer, and the red block is receiving the USB data. As you can see, the data transfer rate is slow compared to the background vertical lines. My Mega was only able to copy data in at around 55 kB/s, resulting in almost 38 ms for just the data transfer. This is close to the peak transfer speeds found in others' experiments. My data parsing code (yellow) also took around 20 ms. Not enough to push the frame rate past 33 ms by itself, but it certainly wasn't helping. At this point, I was updating the strip at 15 Hz. Too slow by a factor of two. Luckily, I had a solution. If the Mega was too slow, I just had to use a faster microcontroller! I happened to have a few Teensy 3.1s fitting around, which boast USB transfer rates up to 20x faster than the Mega. The Teensy is Arduino-compatible, but uses a slightly different library for driving LED strips such as the one I was working with. Still, the interface was basically the same and it took the same amount of time to update the strip (again, determined by the strip, not the controller). I ported my Mega code over to the Teensy and ran it with the laptop still supplying USB data. Blindingly fast! Well, at least compared to the sluggish Mega. The code on the Teensy is similar to that running on the Mega, but colored differently. Lime is the strip update, green is the data parsing, and light blue is the data receive. With the higher performance USB communication and 96 MHz clock (versus 16 MHz on the Mega), both the data transfer and the data parsing have sped up immensely. The frame rate here is about 77 Hz, more than twice what I need. The answer was suddenly clear: use both! The Teensy would receive data from the laptop, pass it to the Mega, and the Mega would update the strip. The only catch was that I needed a way of passing data from the Teensy to the Mega faster than the Mega could handle USB data. By removing some of the code, we've sped up data input by a factor of 8. What exactly did I do? I removed the mask that blocked out the other 7 pins available on PORTA, allowing a mapping of 8 digital I/O pins to 8 bits of internal memory. Now the code will read in 8 bits simultaneously every time that line of code is executed. Not a bad improvement. How does this compare to the serial USB communication from before? The average data rate I could get before was 55 KB/s, or roughly 284 clock cycles of the Mega for each byte. The act of grabbing a whole byte of data using this new method takes only a single clock cycle, leading to an impressive 15 MB/s. This is of course, completely unrealistic. The Mega doesn't only have to read the value of the port, but also store the value somewhere in memory. If I want to do something useful with the incoming data, the Mega also has to make sure each new byte of data gets stored in a unique location. Then there is the issue of synchronization with whatever is supplying the incoming data. You wouldn't want to miss an incoming byte of data, or even read the same byte twice before it is updated. Solving each of these issues creates overhead that will drastically slow down the data rate. The hope is that even with appropriate data management and synchronization, this method is still faster than using serial communication. I found that the process of jumping to the interrupt routine and running the code within took around 6 microseconds. Assuming the data source can instantaneously provide a new byte once the Mega has finished reading the previous one, this allows for an overall data rate of 162 KB/s. Not nearly as good as the overly-ideal 15 MB/s, but much better (3x) than the original serial 55 KB/s. Teensy on left, Mega on right. 8 data lines plus RDY and CLK. The data source for the Mega is the Teensy controller. Since it can handle fast communication with the laptop and has a faster clock speed than the Mega, it handles reading in USB data and splitting each byte up into one bit per pin of the Mega. Starting with the top bar, the laptop spends its time computing what color each LED should be (black), sending the 2048-byte packet over USB to the Teensy (purple), and sitting around waiting for everyone else to catch up (white). Next, the Teensy waits for data from the laptop (white), receives and stores the data (blue), then starts arranging the data and sending it on to the Mega using the parallel protocol (green). The Mega receives the parallel data from the Teensy (red), parses it into LED values (yellow), then updates the LED strip (orange). The most important part of this figure is that by using the parallel protocol, the overall time taken to update the LED strip is less than the 33 ms vertical lines. This means the entire system can finally run at faster than the initial goal of 30 Hz. It's interesting to see the relative time it takes to do various tasks on different computing platforms. The laptop can perform all sorts of complicated mathematical operations to determine what pattern will appear on the sphere in less time than it takes the Mega to just pass on the LED values to the strip. It's also neat to see how each platform independently handles its own share of the work, then joins with another platform to ensure a steady flow of data. And with that, I had a reliable way of updating every LED on the spiral-sphere at right above 30 Hz. While it may not have been the simplest solution out there, I ended up very fond of this method. It was an excellent exercise in simple data transfer protocols and the limitations of different hardware platforms. For the rest of this post, I will move past the Mega+Teensy hardware and focus only on what the laptop has to do to produce the desired LED colors at each timestep. With the communication protocol worked out between each computing platform, my laptop had full control over the color of every LED and could update every value at 30 Hz. All it had to do was produce a properly-formatted 2048-byte packet containing the color values for each LED and send it off to the Teensy once every 33 ms. The next step in this project was to create a series of 'effects' that could be executed on the laptop and would determine what color values to send along at every update. These effects would later be the building blocks of the final visual product, so I needed a fairly general set that could be combined later. When an effect is run, the appropriate function is called at every time step and passed an effect struct, a handle struct, and the current time so that the effect can know how far along it is.With this fairly straightforward interface worked out, I started creating effects. Set every LED to the same value based on color1 and fade. Use projection mapping to display an image from file. The projection method (planar, cylindrical, spherical) and the projection direction are specified in attr. Smoothly pulse the value of every LED between color1 and color2 at a rate determined by attr. 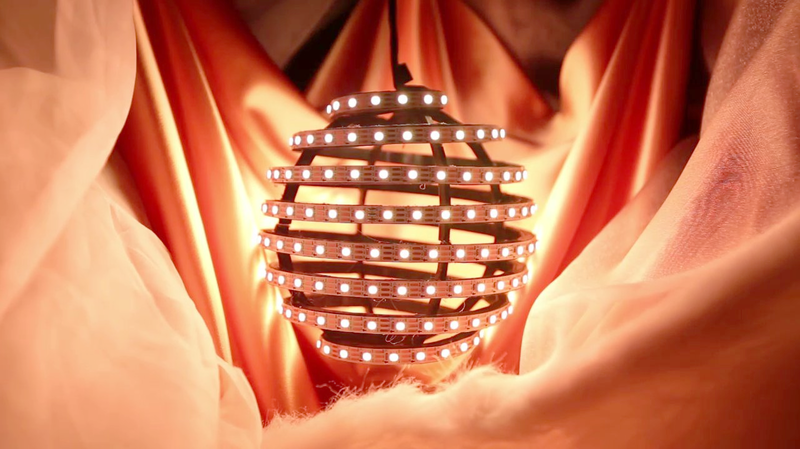 Set LEDs within a certain distance of a specified location on the sphere to color1. The location and size of the circle are specified in attr, as well as a tapering parameter. This effect loads information on the 3D location of each LED from elsewhere. Every time step, tells some number of LEDs to begin lighting up to either color1 or color2. The number of LEDs to light up per second, the fade in time, and the fade out time are all specified in attr. I've used a Poisson distribution to calculate how many LEDs to light up after every time step. 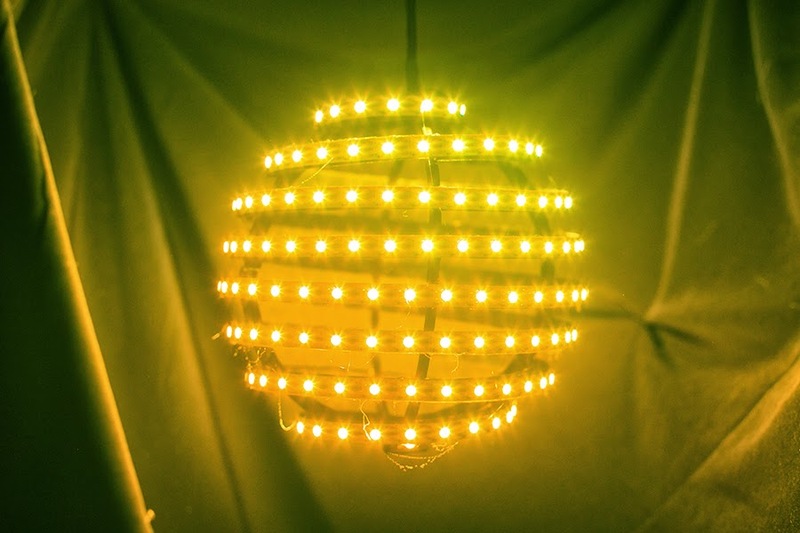 Send a packet of light up or down the LED strip, ignoring the spherical geometry. The values in attr give the packet velocity, origin, and width. Given a start and end LED, lights up LEDs between them with a travelling wave of color. The start LED, end LED, wave speed, and wave length are specified in attr. I wrote three more effects that were mostly variations on the ones above. There is a Marching effect that is similar to Flicker, but synchronizes the LEDs into two groups instead of letting each be random. The Video effect uses the same projection mapping as Image, but projects a frame of a video based on the elapsed time of the effect. The Single-Line Packet is a slight variation on Packet, where the packet of light is constrained to move along a single loop of the spiral-sphere. These effects were all introduced with the specific intention of using them in in the final video production. As mentioned at the beginning of this section, each effect that needs to be running is called upon at each time step. If multiple effects are called, their unique pixel buffers are added together (additive blending) to create the final frame that is sent out to the electronics. For the Image and Video effects, I had the code pre-load the appropriate files before starting into the main loop. This reduced the amount of time spent calculating these effects during playback. With a complete set of effects written up, the next step of this project was to sort out how to create a sequence of effects that could be run as a unit. I not only needed multiple effects to run simultaneously, but to start and stop independent of each other. I also needed to be able to change the attributes within each handle as the sequence progressed. The simplest example of this would be a fade, where the fade attribute in a handle varies smoothly from 0 to 1 over the course of a few seconds, causing an effect to fade into view. # allow comments starting with a "#"
The above example would create a handle with color1 set to red and fade set to 0. The effect Solid would be linked to this handle and launched at the beginning, but since the fade would be set to 0, it would not appear. Over the first ten seconds of the sequence, the fade would gradually increase until it equaled 1.0 (full on) at the end. Writing the code to parse these commands was fairly straightforward. Lines in a sequence file would start either with a #, indicating a comment, or a time stamp. In the latter case, the next bit of text after the space would either be "effect", indicating the launching of an effect at that time stamp, or "h*", indicating the addition of a key frame for an attribute of a handle. Since string parsing is an ugly matter in C, I'll save you the burden of looking at the code I wrote for this. In retrospect, maybe a GUI would have been worth an extra few days of work..
For filming the sphere in action, I would tell the main code to execute one of the sequences. It would pre-load any images and videos, then wait for my command to begin playback. 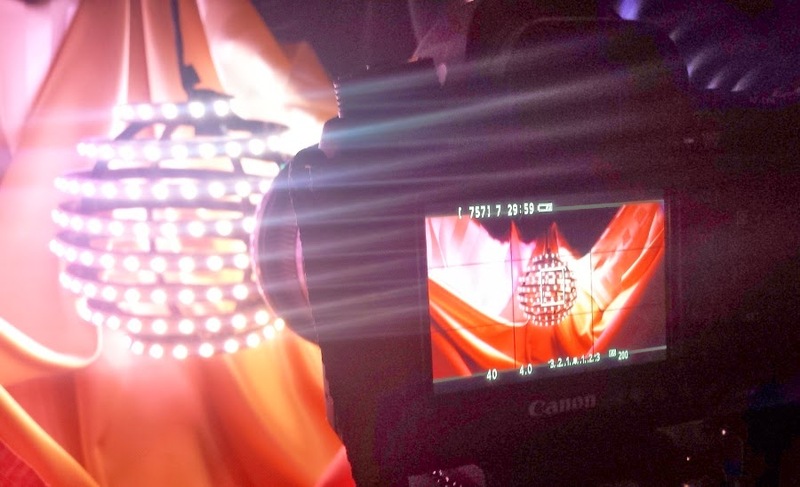 With fabric draped around the sphere and cameras rolling, I would tell the code to play through the sequence. The visuals were completely determined by the written sequences, so we could do multiple takes and get identical results. I could start the sequences at any time stamp and fast-forward through the playback to get a quick preview before we committed to anything. With around 55 minutes of content to produce, filming took quite a while. Writing sequences for the first time was a burden, but going through and editing them during the filming process was a nightmare. Even answering questions like "why is the sphere blue at 4:31" was difficult due to the nature of the sequencing language. The text-based key framing was a simple solution to a problem I had to solve in a short amount of time, but spending an extra few days implementing a graphical interface would have saved me quite a few headaches. When the final full-length video is posted online, I will link to it here. For now, I can give you two still shots. In all, I'm happy with the way this project turned out. Some of the technical bits may have been a little rough around the edges, but I've learned that's what happens when you have only a few weekends to get things working and an ideal budget of $0. 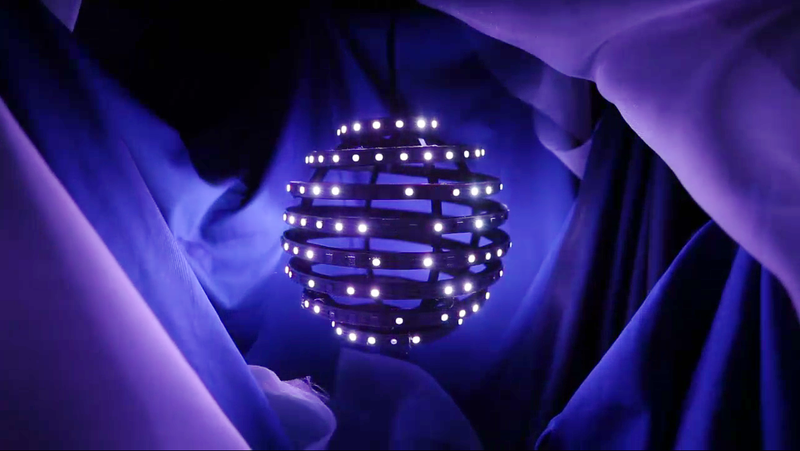 While the Planets project is over, the LED sphere and accompanying electronics are still fully-functional. I'll have to see if I can incorporate them in some other personal project down the road. It might even make for a nice hanging lamp in my apartment.